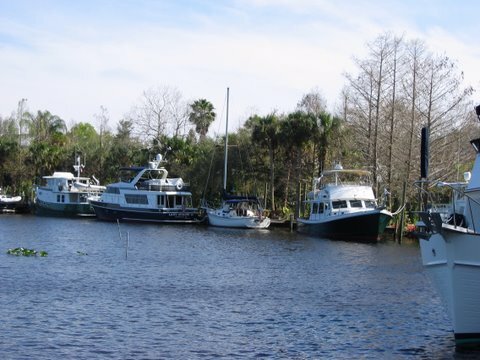 The Okeechobee Waterway is a pleasant and unusual trip for boaters through the heart of Old Florida. This peaceful waterway goes through miles of untouched Florida Everglades and thousands of acres of Old Florida scrub and ranchland. 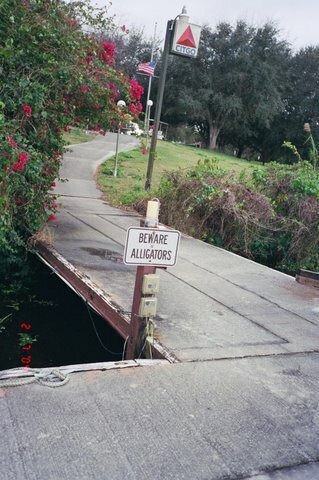 It is the only navigable cross Florida canal. Landlubbers can also enjoy the waterway at the various locks and parks along the route. It's fun to watch the boats pass through the locks along the route. The waterway is 154 miles long and stretches from the Atlantic Ocean near Stuart, Florida to the Gulf of Mexico at Fort Myers. 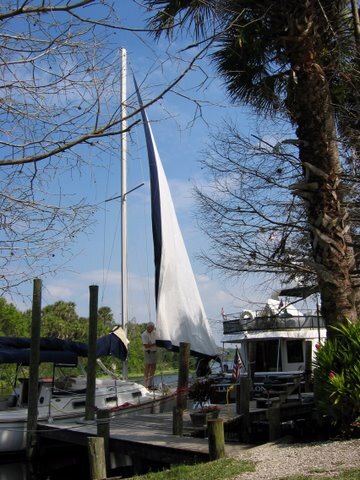 It is the only true cross Florida canal and river system that joins the east coast of Florida to the west coast. 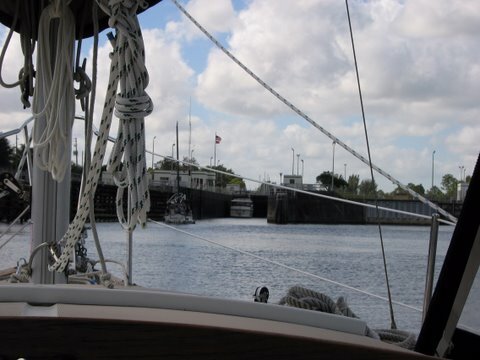 The eastern reach of the waterway starts in the St. Lucie River, passes through the St Lucie lock and dam, and enters Lake Okeechobee through a lock at Port Mayaca. From Port Mayaca you cross 451,000 acre Lake Okeechobee by either a direct route to Clewiston, or a longer route along the south edge of the lake called the "rim route". From Clewiston the waterway continues west on the Caloosahatchee River to Fort Myers. 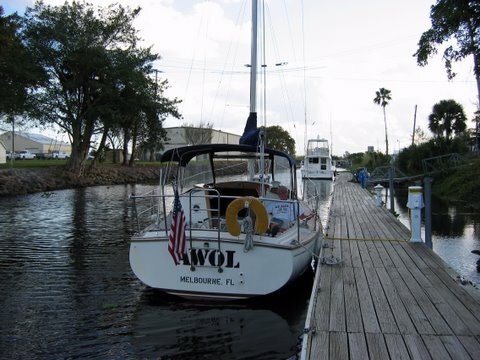 Take a look at the Okeechobee waterway map above for details of the route. 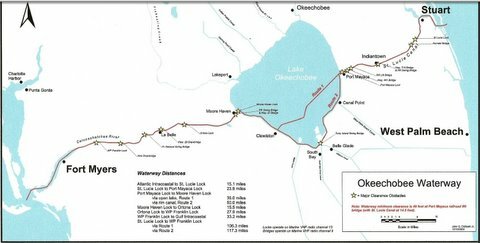 A more detailed Okeechobee waterway map with water depths, day marker, courses, bearings and other information can be purchased at West Marine or other marine stores either as a chart or a book. 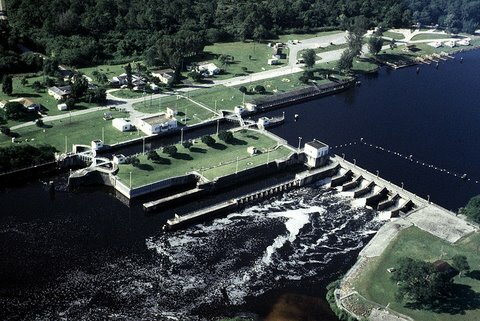 Lake Okeechobee and the Okeechobee Waterway are part of the complex water management system known as the Central and Southern Florida Flood Control Project. This project was built by the U.S. Army Corps of Engineers (ACOE), and is managed by them and by the South Florida Water Management District (SFWMD). This project covers 16,000 square miles from just south of Orlando down through the Kissimmee River to Lake Okeechobee and on south to Everglades National Park and Florida Bay in the Keys. This project is of vital importance to the Florida Everglades. 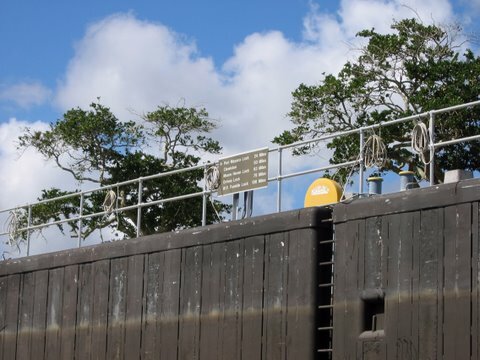 Each lock location has a recreational area that is open to the public for year round use. Some of these areas have camping and picnic facilities. The aerial view of the St Lucie Lock and Dam shows you the adjacent recreational area. 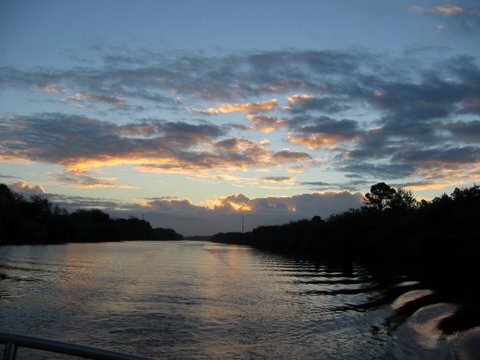 The Okeechobee Waterway was officially opened on March 23, 1937. 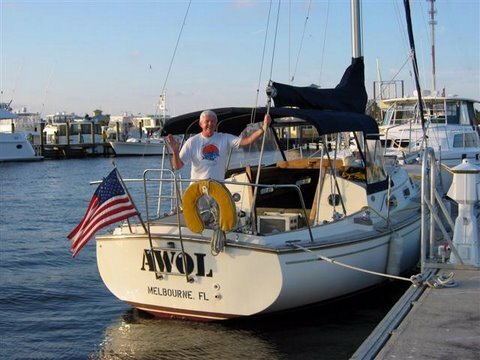 Almost seven decades later some friends and I took a trip from east to west along the waterway in my 26 foot Island Packet sailboat, AWOL. Here are highlights of that trip. Remember, it was in 2004, so don't rely on this article to still be accurate. Things have changed, marinas close, new marinas open, and so on. If you plan to make the trip, buy a new waterway guide. The trip began in Coconut Grove on Biscayne Bay, and after a couple of days on the Intracoastal Waterway, we spent the night at a marina in Stuart, ready for the start of the adventure. These are photos of the St. Lucie Lock and Dam, the first of 5 of these structures that we will encounter on the Okeechobee Waterway. 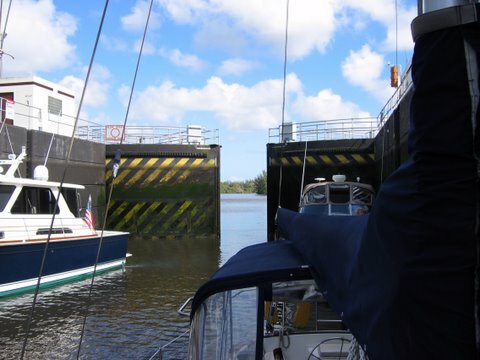 This lock is a few miles up the St Lucie River from Stuart. The sign on the rail shows you how far it is to each of the other locks. Passing through the lock is easy; the lock tenders know their business very well. This is a beautiful sunrise taken as we left the Indiantown marina and continued west on the quiet St Lucie Canal to Port Mayaca and Lake Okeechobee. If you have a sailboat, you should be aware that the controlling height on the waterway is the 49' raised railway bridge at Port Mayaca. A mast as high as 55' can pass through if the boat is heeled over by the weight of water-filled barrels, a service provided by a guy working out of the Indiantown Marina. After a day chugging along the southern shore of Lake Okeechobee (the rim route), we came to Roland Martin's in Clewiston. Roland Martin is a famous fishing celebrity. His little resort has motel rooms and some boat slips. 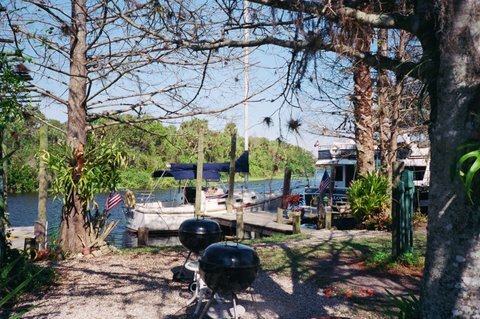 A shuttle bus will come to the marina and take you to the nearby Clewiston Inn where you can enjoy the famously tasty Lake Okeechobee fried catfish. 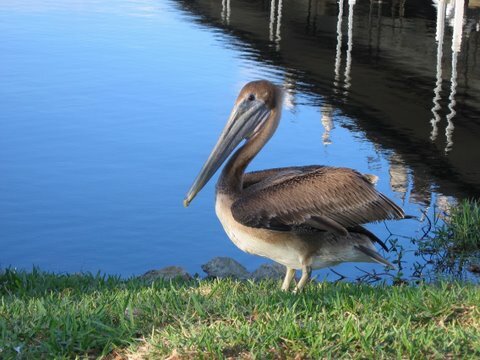 Ogden Nash once wrote "A marvelous bird is the pelican, his beak can hold more than his belly can". This guy (or gal) is a fine specimen who didn't mind our presence at all. He would be in heaven if you took him to the all-you-can eat catfish dinners at the Clewiston Inn. This little Gator welcomed us to our slip at Roland Martin's. We are smart Floridians, and knew better than to feed these guys. Do it too often and you soon become the food. 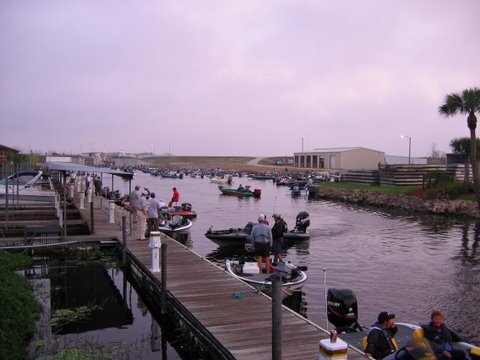 The early morning hours were abuzz with the little bass fishing boats and their crews getting ready to head out to Lake Okeechobee for a fishing tournament. 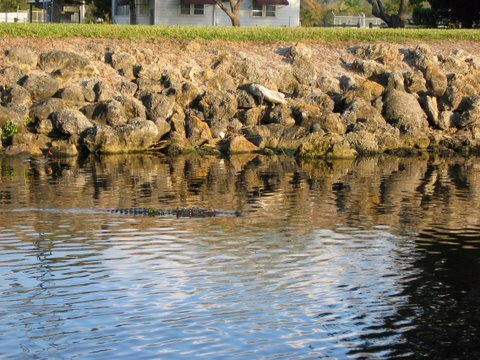 The lake and its shallow shorelines are known for the best bass fishing along the Okeechobee Waterway. 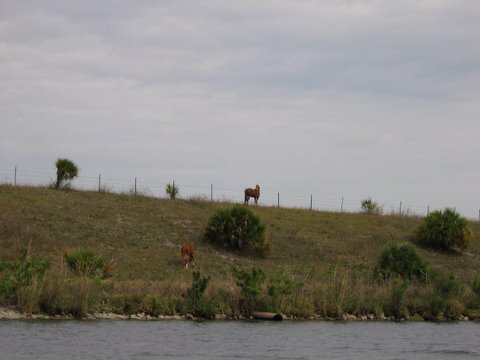 Somewhere out west of Moore Haven these horses are grazing on the kind of ranch land that Patrick Smith describes in the classic Florida historical novel "A Land Remembered". There was a quiet little marina at Port LaBelle east of the town of LaBelle where we spent a quiet night. The weather took a February turn for the cold, so we shivered a bit and were glad to have the warmth of another human being nearby. Shortly after our stay at this little marina, it was demolished and replaced with a more modern version. About 2 miles west of Alva there is a quiet little marina called Rialto Harbour. It is in a secluded oxbow. Natives of the Caloosahatchee River call these oxbows "dead river". Rialto is a great place to spend a few nights. It is owned by a wonderful family. Their few employees are also like family. It was still a cold winter night, and the owners built a fire in the fire ring and cranked up the charcoal grills for a cook out and story telling session around the fire. Note: I received word in 2013 that Rialto Harbour is closed for business. 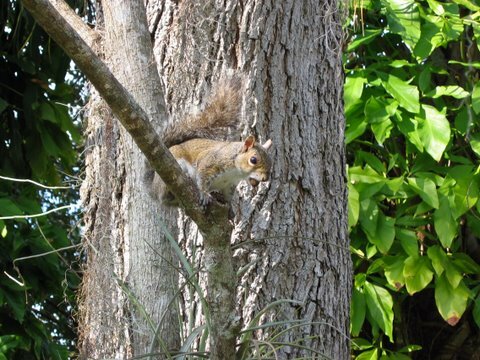 This little squirrel on a Rialto Harbor tree agreed with us as we sadly powered back out to the Caloosahatchee River on a cold winter morning to leave the Okeechobee Waterway. AND GET BACK TO OUR REAL JOBS! 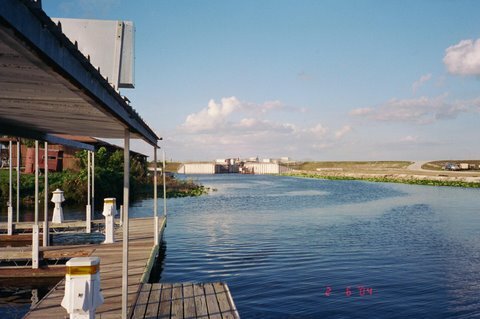 Information about the Okeechobee Waterway that you should know in planning your own trip is at the U.S. Army Corps of Engineers website. This includes current waterway elevations for Lake Okeechobee and the St. Lucie and Caloosahatchee portions of the waterway.